Both my girls love making crafts and generally find all that has to do with being artistic quite fun. I know I have mentioned previously that Kevin is an artist and the girls definitely have a bit of his excitement for this. They not only love crafting, but they love their family and friends, too. 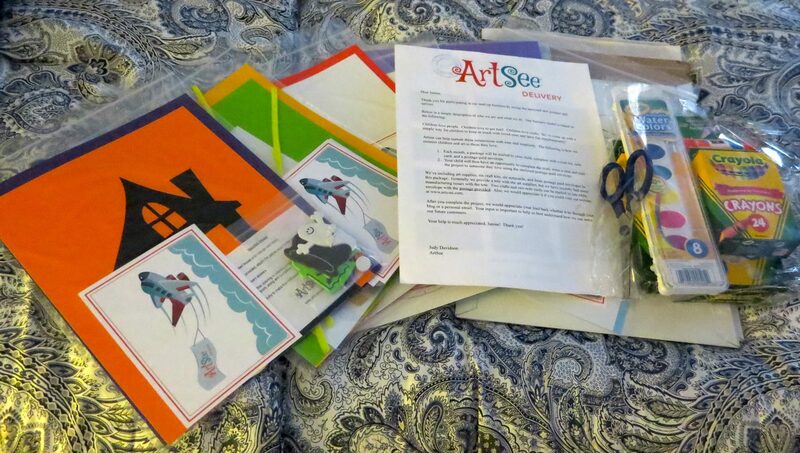 So, when we were asked to try out and review ArtSee, which is a company run by four sisters, who just happen to be mothers, grandmothers, as well as educators, too, I jumped at the opportunity, because ArtSee’s was created to foster the family and friendships through arts. The concept is simple helping families easily stay connected in a fun way through art projects. As soon as I opened up my package, I knew this was going to be fun. Our box included art supplies (washable markers, crayons, scissors, watercolor paints, glue stick), six crafts kits, six note cards and there postage paid envelopes, too. 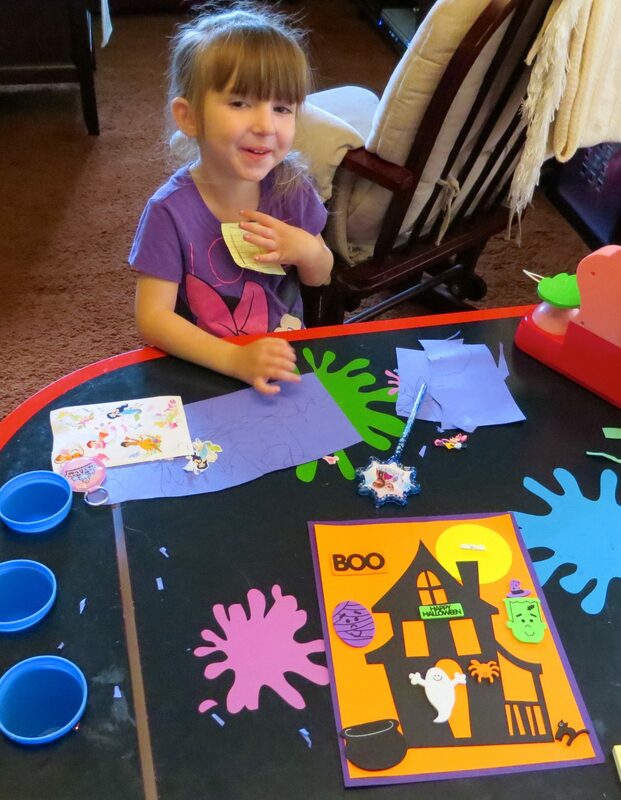 We tried the October (Halloween craft), which is the featured craft for this upcoming month for starters on a Sunday afternoon after Emma’s morning soccer game and lunch. Emma Had a Blast Putting the Haunted House Project Together! 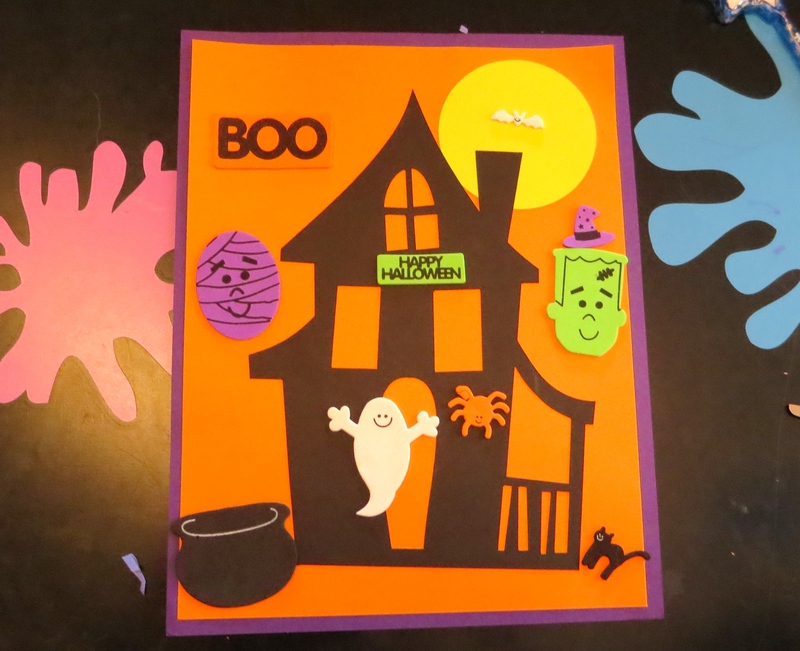 The Halloween themed craft was a haunted house and all ways to decorate with stickers, too. Lily All Smiles After We Put Together the Haunted House! 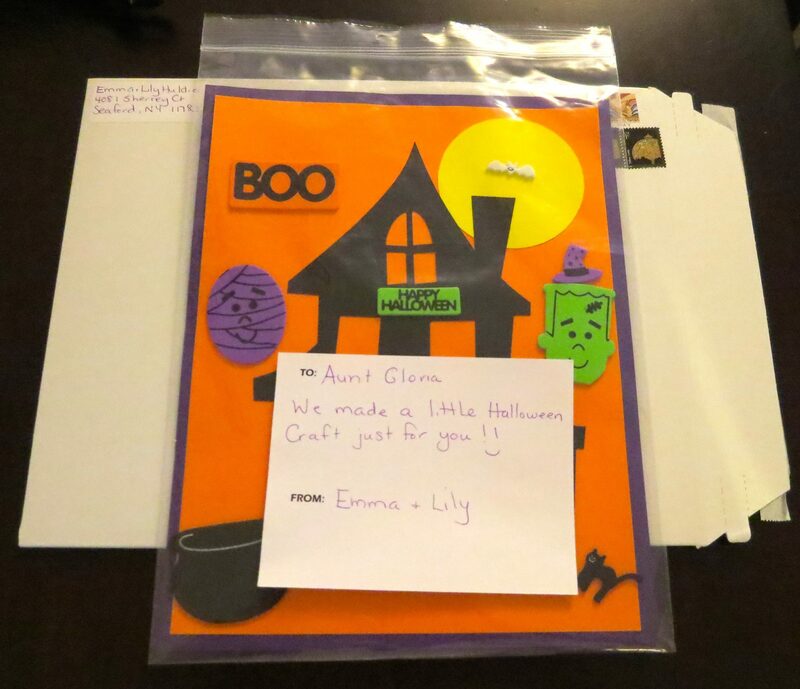 My girls loved it and decided quickly to make it together to send to their Aunt Gloria, who lives a few towns away (By the way Aunt Gloria got her art mail from the girls and called to thank them – so a true hit on both ends!). We had fun crafting together and once it was completed the girls happily put it in the envelope. I, then, addressed it to send out in the mail the following morning. 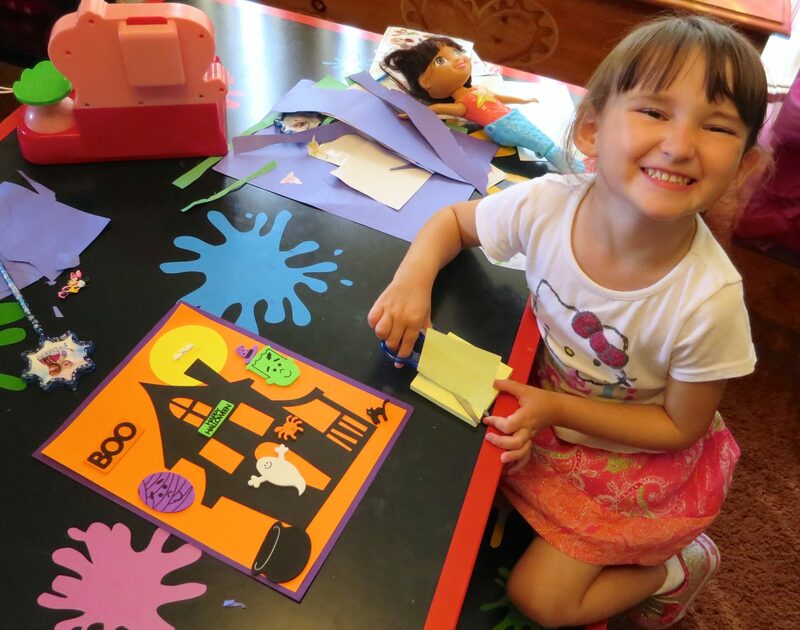 Look Out Aunt Gloria, Your ArtSee Haunter House is On Its Way from the Girls to You – Boo! All-in-all a fun time was had and now we have more art projects to get to just in time for the girls being home at the end of the week from school for the upcoming Jewish holiday and weekend, too. To get your own monthly project (Includes the craft kit, note card, pre-addressed postage-paid envelope) from ArtSee, it will cost $10.99 plus a $4.99 sibling add-on (Craft kit only), as two kids can indeed send two projects in one pre-paid envelope. Also, the yearly subscription (Includes the craft kit, note card, pre-addressed postage-paid envelope) is $9.99 plus the $4.99 sibling add-on (Craft kit only) fee. This weekend at Janie and Jack – the 25% off Friends and Family sale by Sunday, 10/5 use the code JJEXCLUSIVE. am I the first one?! Omg!! I feel like I need a medal lol! Love this ArtSee!! My son is actually enrolling in art classes soon so this is perfect for him. Thanks for sharing!! Very cute! And I know that aunts just love that kind of mail! My boys would all over this!!! What an awesome idea. Very cute! I am *really* looking forward to doing arts & crafts projects with Eve when she gets older. I’m all for any product that gets kids involved in crafts. I hope your Friday is spectacular, Janine. I can see on Emma’s face how much she loved making this art project. She looks so proud of it and should be. It is really cute. Please tell her I said she did a FABULOUS job. very cute idea, lucky you got to try it out! Of course I love this idea — since it is my sister in law and her sisters who are the founders of ArtSee!! But, I LOVE how adorable your girls look doing it – looks like fun and the craft is awesome! I also know how appreciated it is by the recipients — you stay connected and get to get something fun in the mail every month! It’s really a win win for everyone: easy for mom, fun for kids, and connecting to distant family! Thanks Janine! So cute! I would have loved this when my kids were younger – save a trip to Michael’s, where I end up dropping a pretty penny anyway! I just ordered the november project online. The website is great and easy to use. Cant wait for my boys to try it out. I will definitely be ordering more. Nice job Artsee! Oh this looks SO AWESOME Janine!! 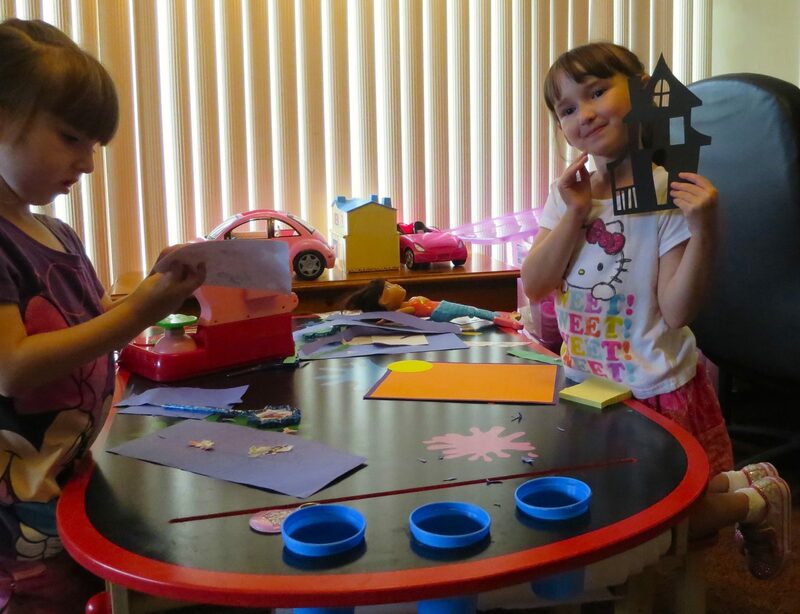 I love that all four are moms/grandmothers/educators… I’m sure they know exactly how to engage kids with crafts! What a wonderful package to play with and explore! OK, those look like so much fun! And they came out awesome. Nice job! Janine, did you write this post just for me. This is this mommy’s dream. I love this.I want one. What fun! Your girls look so engaged and proud. I love that they made this for their Auntie too. That’s just precious! Thanks for sharing. This looks really cool! That kit does look like awesome fun. I love that it’s family owned, and I love that table you’re using (is it a chalkboard surface?). It looks like they had a lot of fun. Enjoy your weekend with your kids and Hubby! So cute! I can’t wait until my girls are old enough to sit down and do crafts. Right now, Bee doesn’t want to listen to anything, and Butterfly is just too young. This is so awesome! Scarlet would be in 7th heaven with this. She LOVES art, but doesn’t love art class in kindergarten. I think it has something to do with the teacher. Totally weird. Anyway, she still has the passion for it elsewhere! This is so fun! My boys would love it.